Milestones: On the Road Home is a collection of reflections on living together in grace and truth. Gleaned from Scripture, over 25 years of counseling experiences, and real-life examples, Milestones is biblical, insightful, and fiercely practical. It offers guidance to challenge and encourage you on your road to intimacy with God and others. The questions for reflection, suggested prayers, and identified “milestones” for each chapter bring the relational message of God’s Word all the way home—to your heart! Milestones can be read front to back if desired, and it has a fluid rhythm for that purpose. You may also peruse it like a menu, choosing what you need most on a given day. If you meditate on each section for a day, Milestones will be on the path with you for a biblical sounding 40 days. Most of us benefit from being reminded, so I hope some of you live with the book, reviewing sections that are especially encouraging or challenging. However you might choose to use Milestones, I pray it draws you into deeper commitment and relationship with God and others. Savor the journey, and bring someone along. See “Availability of Milestones” for latest details on availability and options. A few years ago, a small flame began to kindle in my heart. I felt a gentle but relentless tug to begin to write down some of my hard-earned lessons, especially the ones that have a direct impact on people’s relationships with God and other people. My blog “grace and truth” (stevewarnerjohn114.blogspot.com) was started in July 2010. To my surprise, the Spirit of God quickly carried it to hearts in almost 80 countries. Some of the posts have also been featured by magazines. Many readers have asked if I have considered compiling these writings into a book. 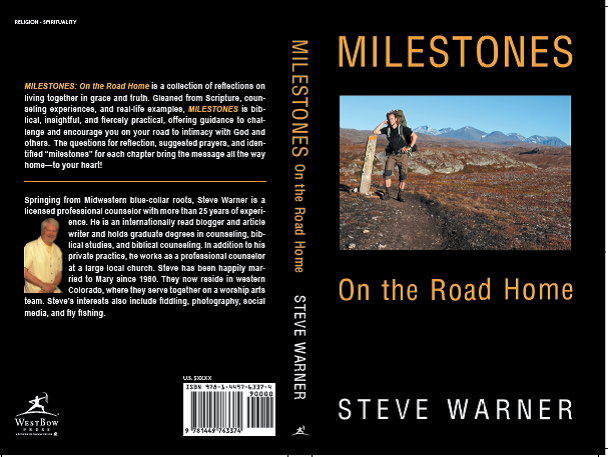 The coming book, Milestones: On the Road Home, will carry some of the most loved messages to a whole new audience. The lessons are edited, updated and augmented with questions, prayers and “milestones” for progress on the path to intimacy with God and others. Even the most faithful follower of my writings will find them fresh and more personal than ever. I am eager to see what God does next with this, his project. Success is defined as his pleasure. I also pray a few lives are touched for now and eternity. Available now! See “Availability of Milestones” for details.